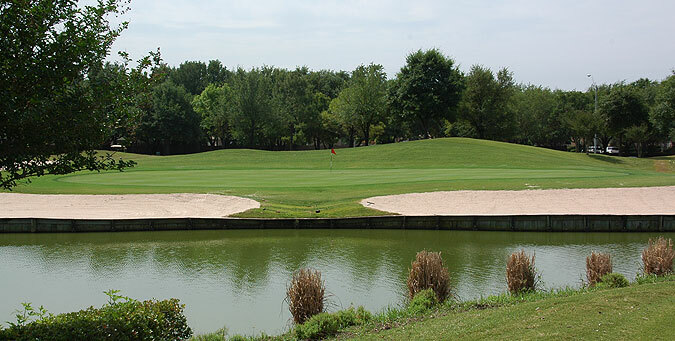 Cinco Ranch GolfClub in Katy just west of Houston is one of the area's top upscale public daily fee courses, and is located in the master planned community of Cinco Ranch. Designed by Carlton Gipson, this 18-hole championship layout features a combination of sand and water, with excellent playing conditions from tee to green along a rolling terrain. Perimeter water hazards come into play frequently - as ten holes are affected by ponds, lakes or crossing creeks. Forty seven white sand bunkers are scattered along the course, strategically situated near the landing zones or greenside. Golfers will encounter generous fairways flanked by trees, that lead to large, undulating green complexes featuring Tif Dwarf Bermuda - a great true-rolling putting turf. Most of the greens are gently raised with surrounding mounding and undulations, but with ample recovery room. There are 4 sets of tees that play to distances and slopes measuring 6922 yards/133 slope, 6396 yards/128 slope, 5822 yards/123 slope and 5167 yards with a slope of 118 from the forward sets. On course 100, 150 and 200 yard markers are posted on the fairways and cart paths, and sprinkler heads are measured to the center of the green. Pro Link GPS on all carts provides accurate info from tee to pin - with a yardage screen also mounted on the back of all carts. Rear cart covers are also standard, providing protection fro golf bags during inclement weather. The practice facilities promote one of the country's best player development programs. A double ended range complements a wonderful short game area with sand bunker, plus two large putting/chipping greens. Clubhouse facilities include a pro shop, locker rooms, plus snack shop with lunch items, breakfast sandwiches and beverages. A well appointed banquet/outing room can accommodate up to 300 guests. 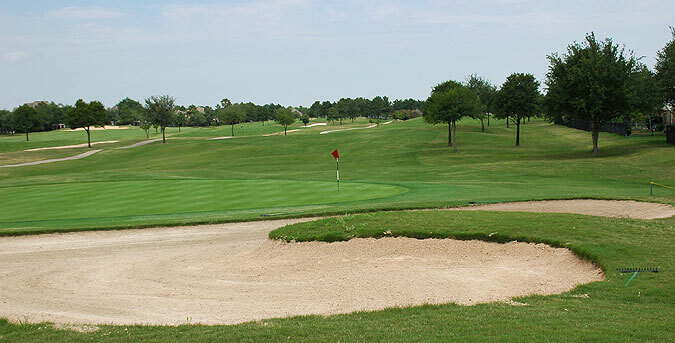 Golfers of all skill levels should find Cinco Ranch a challenging yet enjoyable golf experience. The excellent facilities and wonderful service make this an outstanding venue for tournaments and outings. We highly recommend a round here. Pace of play is 4 hours and 15 minutes and a 24-hour cancellation policy is in effect. For more information, visit our page for the course, with direct link tot heir website by clicking here.